The garden known as Jardin des Vestiges in the downtown core of Marseille in the Provence, France is loaded with history and symbolic plants. A shopping centre, the Mediterranean Trade Center and an amazing historical museum were all started in 1977 in Marseille, France in Europe. 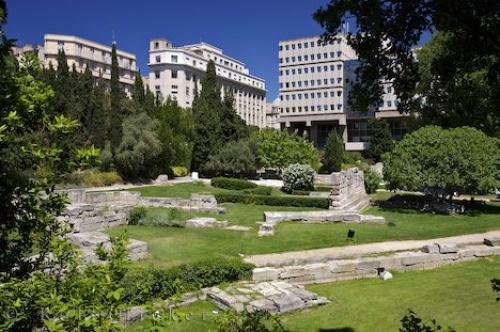 A garden was then created opposite the museum where many relics of the Greek and Roman were found in 1967. All the plants surrounding the garden of Jardin des Vestiges in Marseille, France have symbolic virtues which are associated with the Greeks.This site is Marseille's main history area where many visitors find the museum at Jardin des Vestiges extremely intriguing along with the port, Greek fortifications, fresh water basin, streets and cemeteries.The Jardin Les Vestiges in Marseille, France is open daily from early morning to sunset for any tourists to explore. There is a lot to be learned about Marseille in this garden and it is well worth the visit.Garden, Jardin des Vestiges in downtown Marseille, Bouches du Rhone, Cote Bleue, Blue Coast, Mediterranean, Provence, France, Europe. Photo of a historical garden in Marseille in the Provence, France in Europe.